I, like every other girl out there, love diamonds. They are gorgeous and so sparkly (ok, I sound 5), but seriously, diamonds are something that every girl should own. Ever since I was a little girl, there was little more that I wanted than to have a nice piece of diamond jewellery in my hands, and I do remember trying on my mum's diamond rings, which were quite big for me at the time. So, I was really excited when I discovered Abazias. They have some great fashion jewellery, from Wedding Bands to Earrings. When I find Mr. Right, I will definitely leave his internet browser open at their website, so that he can shower me with presents from it. Here are some of my favourites from the website. It was really hard to narrow it down to 3 gorgeous items! I absolutely love this necklace. It is stunning and really is something you can wear everyday. 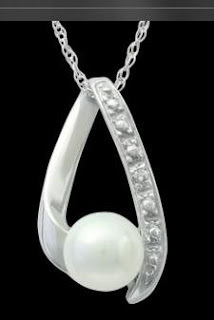 I love pearls almost as much as I love diamonds, so this necklace really is perfect. 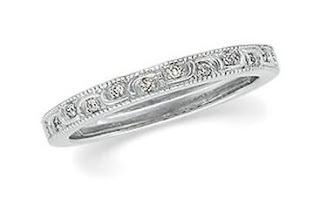 Everything on the website was so pretty that I even ventured to where the Wedding Bands were, despite getting married being the last thing across my mind, and I came across this ring. It is made so beautifully, and I can definitely see myself flaunting it. My favourite accessory of all time is a bracelet, and Abazias have some gorgeous bracelets. This one caught my eye instantly and it really was love at first sight. Although it is slightly out of my price range, I'm sure I'd be able to get someone to chip in and get this for me. It is so different from everything elsee out there right now, and uses both black and white diamonds. The pattern is lovely and I can really imagine it sitting on my arm, just sparkling. So, these are my favourites, but by no means are the only ones I love. The website is really full of some pretty brilliant stuff that you all have to check out. All pictures are courtesy of the Abazias website. I totally agree with you! my favorite accessory is my diamond bracelet, I wear it everyday! Such lovely pieces. I especially love the diamond and pearl necklace. It is so right that diamonds are best girl's friends! :) I love ring! It ia amazing! Ah I love the first one best! i always thought a pearl surrounded by diamonds was beyond the most incredible pairing! i actually dont like diamonds that much (they are pretty sparkly though and i love walking by jewelry stores and staring at them haha) but pearls are my fav! I would never wear diamonds- the blood diamond industry is horrifying and I don't want any part in supporting it. My fave precious stones are emeralds and pearls. I have a necklace with an emerald stone in it that is a celtic knot- a gift from my father's late mother. And I also have 2 pearl bracelets as a gift from my mum's sister from singapore. Gorgeous pieces! I love diamonds. They are so sparkly and fabulous! oh yes. diamonds are the best girls friends. great post. Have a nice day ahead! Gloomy day in here. That necklace is amazing! And definitely wearable on more than just special occasions! That band is super pretty!